This 44 ton artic got lost (sat nav problems?) and in trying to escape from a minor residential road dragged its rear bogey over a bollard put there to prevent vehicles from encroaching on the pavement. Unfortunately the bollard also pierced the hydraulic brake cable, which then for safety reasons immediately locks the wheels. This meant the lorry resembled a stranded whale and couldn't be moved for 3 hours while a repair van was summoned. 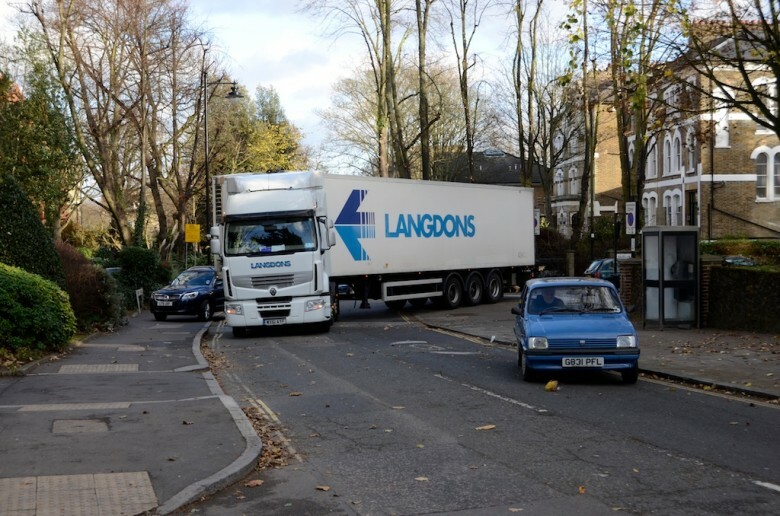 The police arrived and then refused ("Vehicles are not allowed on the pavement, it's more than my job's worth") to let cars mount the pavement to get round the obstruction as they are seen doing here on both sides of the lorry, thus ensuring huge delays on several neighbouring roads.